Retirement should be the easy part of life, where one should relax and not bother much about things. Hence, planning at an early stage can ensure that you are on the right path to make your retirement happier and monetarily stronger. Ageing population is a growing global concern. Globally, the elderly population, defined as 60 years or more, constitutes 12% of the total population and is expected to account for 22% by 2050. In India too, the number of individuals over the age of 60 has been rising. They account for over 8.6% of the total population, and by 2050, every fifth Indian will be in their 60’s as against every 12th at present, as per a PFRDA-CRISIL report. Growing old becomes synonymous to living with less or no income. Moreover, factors such as the lack of independence and social security, falling health, and inability to remain productive are the top concerns for the elderly population. The absence of assured and sufficient income to support health costs and social lifestyle in turn increases old age dependency. India’s old age dependency ratio, as per 2011 Census data, is also increasing faster than expected and stands at 14.2 against 10.9 in 2001. The age dependency ratio denotes the ratio of older dependents (people above 64) to the working-age population (those between 15 and 64). Higher old-age dependency reflects an increased level of demand for care from immediate family. However, factors such as extended life expectancy and the rising cost of living and healthcare are making it increasingly challenging for the children to support their parents. 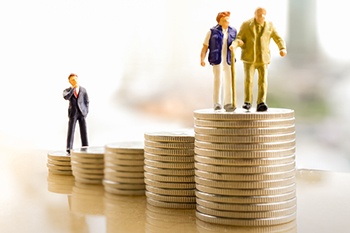 Going forward, a rapid increase is expected in the number of retirees who will have to sustain on their savings to meet their post-work life expenses. According to a report by HSBC titled “Future of Retirement: Bridging the Gap,” only 33% of working age Indians save regularly for their retirement. On the contrary, India’s saving rate should be much higher, as per the life-cycle theory, given that most of its current demographic dividend consists of working individuals. Tax benefits: One of the key areas that must not be overlooked during retirement planning is taxation benefits. Taxation reduces your income, but investments in tax-saving schemes can help you lower your tax burden and save more for your future. Provisioning for a longer life: The average Indian is expected to live up to 68 years of age, according to a WHO report of 2016. Life expectancy in India has increased by more than 10 years since 1990 and it means that now you will have to support yourself for an additional decade when compared to the same 20 years ago. Growing life expectancy demands that you start your retirement planning early to create a big corpus at the time of retirement. Peace of mind: Planning ahead for your retirement will not only reduce stress and uncertainty but will also give you more corpus to do whatever you want. As the future is uncertain, these investments can extend support to your spouse and dependents in the event of demise. These benefits can be attained only if you set a financial goal, a purpose, and of course, start making investments at an early age. Retirement planning should be done keeping in mind that your retirement corpus is adequate to meet your future requirements. Basic living cost: Individuals have varied ideas of what an adequate income looks like, based on their lifestyle and how they envision their retirement. You should assess the corpus that you wish to create basis your lifestyle costs and aspirations. Maintaining a sufficient liquid reserve for unexpected events and exigencies is also of equal importance. Timeline: Once you’ve decided on your desired lifestyle and contingency reserve, you should assess the timeline or the number of years you have to save for. The age you plan to retire can have a significant impact on the amount you need to save, and your milestones along the way. The earlier you start your retirement planning, the easier it will be to reach your savings goals. Retirement is complex. In order to make the most of your retirement years, planning for effective management of your money is critical. The retirement plan should balance your needs, wants, and the reality of your finances. Moreover, it is essential to keep revisiting your strategy to grow your money faster to give you the income you need post retirement. Finally, if you start saving for retirement when you are young, even if it is a small amount, you are more likely to develop a lifelong habit and enjoy a more secure financial future.